Ben, the male lead, will be played by…. Yoshimi Battles the Pink Robots will be a major multimedia work complete with a live rock band, light projections, dancing, aerial choreography and ten high-tech puppets. Basil has also worked on Broadway’s The Pee-wee Herman Show and The Addams Family (read more at basiltwist.com) as well as several La Jolla productions (watch here behind-the-scenes at A Midsummer Night’s Dream) and is most acclaimed for his underwater puppet show, Symphonie Fantastique. 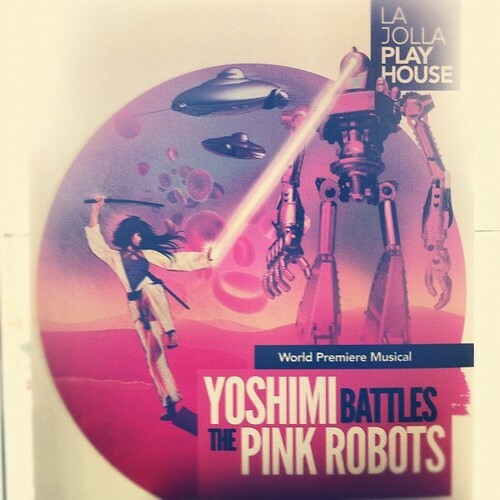 In fact La Jolla Playhouse says Yoshimi is “a production so innovative that we are actually commissioning new technology to bring the vision of Des McAnuff to life.” The construction of these 14-foot robots is just “one of the numerous technological marvels in this ground-breaking production” the playhouse is fundraising with their “Adopt a Robot” drive. Donate via the form at La Jolla’s link above (or click on the above “Adopt” icon). 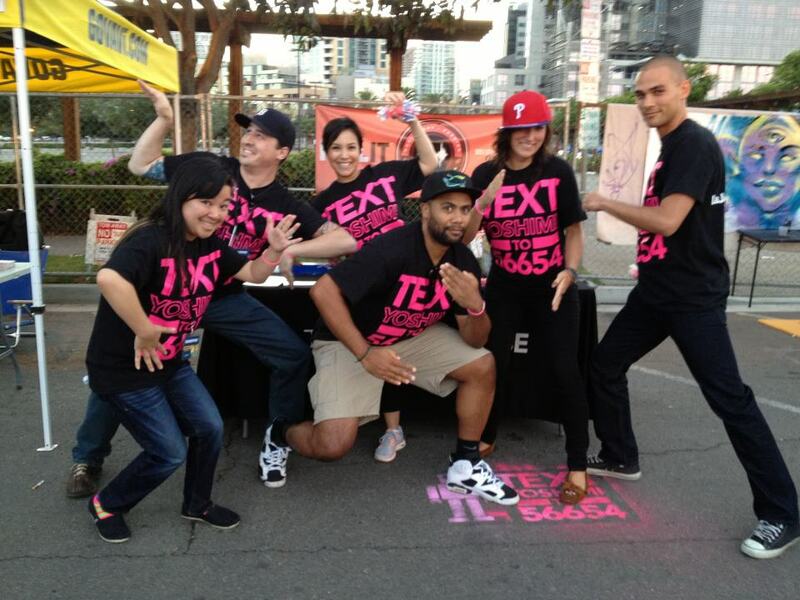 …in any case, “Team Yoshimi” recently took over San Diego East Village’s Night and Day Street Fest (pictured above via facebook/LaJollaPlayhouse) and San Diego Comic Fest (pictures here). La Jolla Playhouse has also teamed with Psych Explorations of The Future Heart to help spread word of this groundbreaking production. Fans who do street team work in the San Diego area are eligible for a pair of free tickets to one of the first showings. Details were posted here. Here’s some of the fans that have already earned free admission! Are you 30 or under? 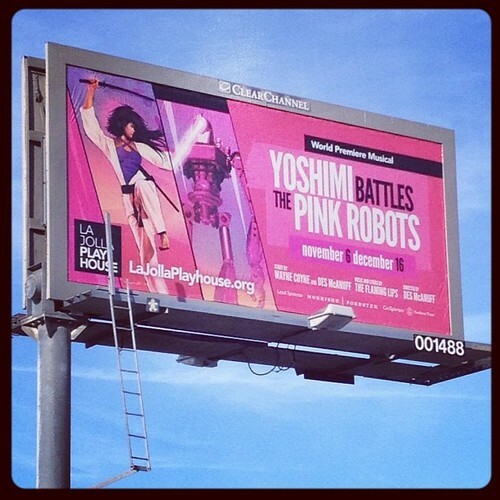 $20 tickets to select performances of Yoshimi Battles the Pink Robots are here. Additionally San Diego radio station 94.9 FM is offering $30 “area 2” tickets and 20% off “area 1” tickets with their promo code, “949.” The station is also handing out tickets at RAOK, 333 N. Johnston Ave. El Cajon on November 4th from noon to 2PM. 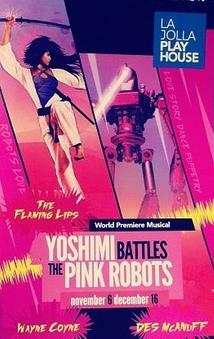 This morning I won some tickets to Yoshimi Battles The Pink Robots (the musical!?) Thanks @FM949sd!! Discounts are also available just for being a Flaming Lips fan! Use promo code ‘LIPS30’ for the same discounts described above for 94.9’s code. Use promo code ‘LIPSVIP’ to activate the discount online. The first 50 fans receive a free gift from The Flaming Lips! Other discounts may be announced in the upcoming weeks. 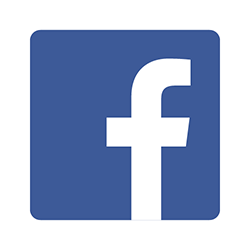 For the latest updates follow twitter/TheFutureHeart and “like” facebook/TheFutureHeart (make sure to click in upper right corner of page to include Future Heart posts in your “news feed”). La Jolla Playhouse is giving away a pair of Friday, November 9th tickets through facebook/TheFutureHeart. 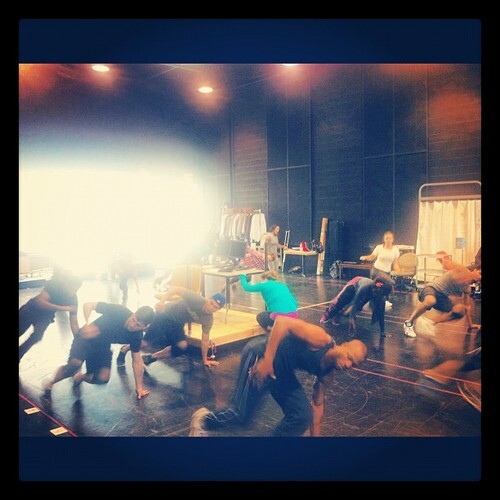 This special 8pm preview performance is over a week before the official press opening! La Jolla Theater is also running a contest on their facebook page (facebook/LaJollaPlayhouse) in addition to the tickets they are giving away through facebook/TheFutureHeart. Yoshimi’s world première runs through December 16th at the Playhouse’s Mandell Weiss Theatre (2910 La Jolla Village Drive, UC San Diego campus) 7:30 p.m. Tuesdays-Wednesdays; 8 p.m. Thursdays-Fridays (except Thanksgiving); 2 and 8 p.m. Saturdays; 2 and 7 p.m. Sundays. Once again, tickets for all nights are on sale here, or call 858-550-1010. This is Yoshimi Eve. Yup, we become pioneers and puppeteers switching gears into the Land of the Lips. BRING IT, ROBOTS!!! 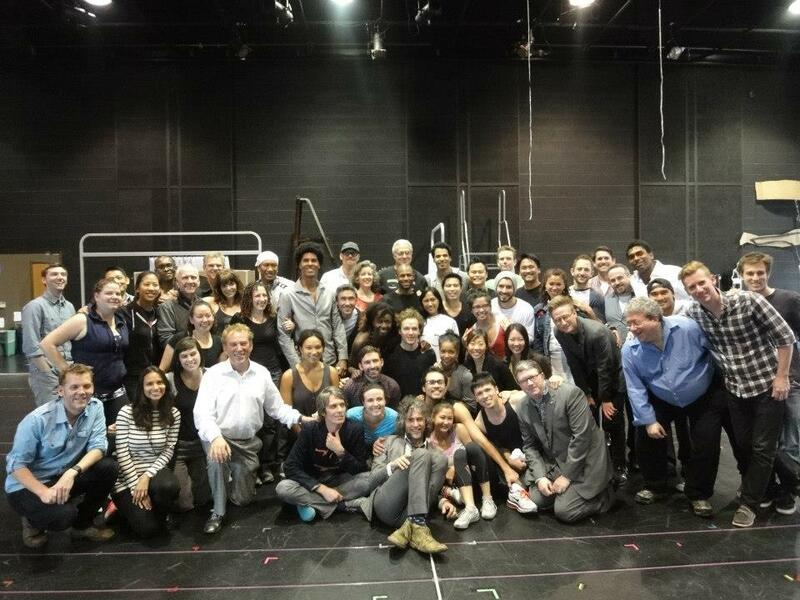 The Flaming Lips came to the run through of our show this morning! Wow. We might as well have been visited by William Shakespeare. 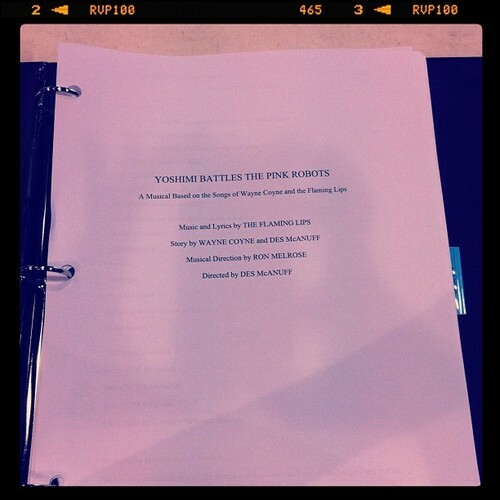 First day of tech for Yoshimi Battles the Pink Robots. Uhh…this has NEVER been done before. Everyone needs to see this. Des is a genius. 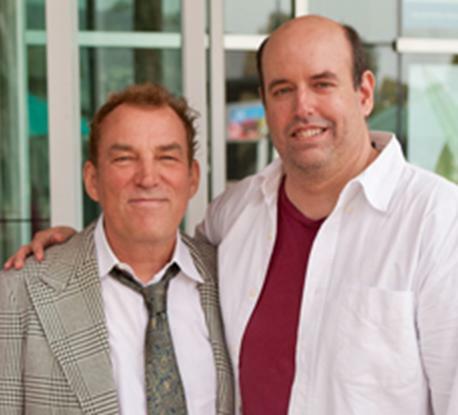 Although Coyne and Lips manager Scott Booker have overseen the creation of the new musical, it is largely the work of Tony Award-winning director Des McAnuff (pictured to the right with La Jolla Playhouse Artistic Director Christopher Ashley at Yoshimi’s first rehearsal – photo by J. Katarzyna Woronowicz). 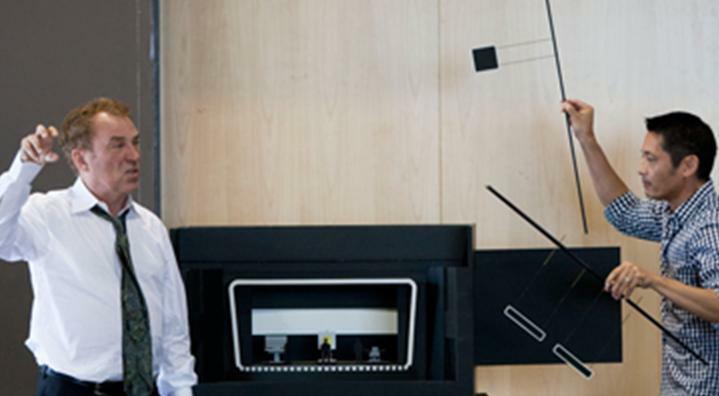 Des revived La Jolla’s Playhouse in 1983 and has served as its artistic director off-and-on since. He debuted both The Who’s Tommy and Jersey Boys at the Playhouse, before bringing them to smash Broadway success. McAnuff is now in his final season as artistic director at Stratford, though he’ll return to director a revival of the The Who’s Tommy in 2013. KPBS San Diego’s “Evening Edition” will air an interview with Des at 6:30 PM on November 2nd. More info here. Ben Nickel – a mercurial spirit in a three-piece suit and an open bow tie (which serves as a kind of uniform in a Chaplin-esque fashion) – is a computer graphics designer for a publishing house. 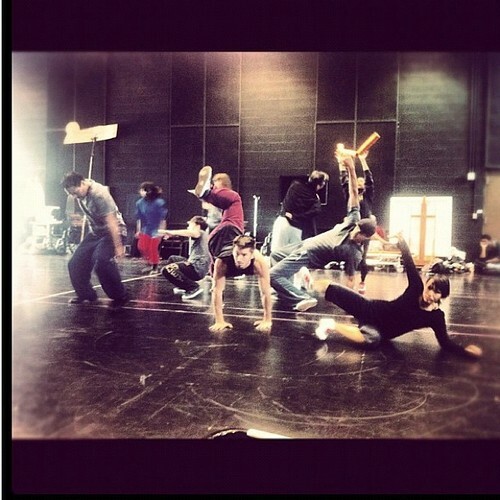 A caucasian, about 30 years old, he dances, clowns around in a gawky way but is charming and attractive. Booker is a tall, athletic, good-looking business-man in a suit, white shirt and tie – an investment counselor and broker (like Ben he is about 30, but African-American). Both Ben and Booker are in love with Yoshimi Yasukawa, a beautiful, first generation Asian-American visual artist (and later a Freedom Fighter). Before she can resolve the war between her two boyfriends she finds herself fighting for her life. “MR. YASUKAWA: 50s; Rock Tenor or high; May look frail but must sing with surprising confidence, passion and strength; Baritone – Asian – 1st generation Asian immigrant. YOSHIMI’s father, a rather stern, concerned parent – middle class business man. Capable of moving. Her name is Yoshimi. She's a black belt in karate. Working for the city. She has to discipline her body. …. a magical fable that takes place both in the modern world and on a science fiction landscape where there is an army of pink (puppet) robots – or something like that…. In 2007 Coyne told Billboard the Lips would “write some things to connect [their previously released] songs. That all sounds wonderful” (and likewise to World Entertainment News Network in 2010, “We would incorporate all the songs and probably write some other music that told a little bit more of a story”). 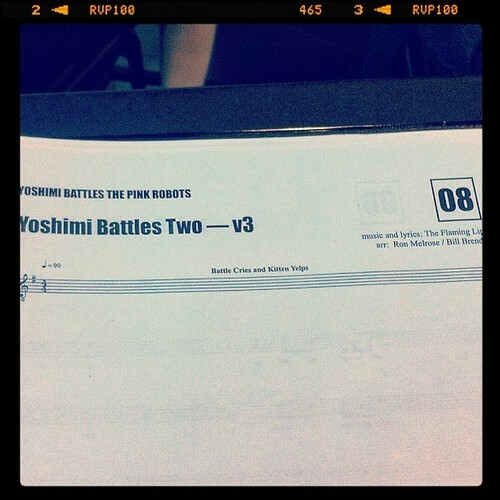 “We’ve talked about doing something with Yoshimi Battles The Pink Robots now for… years. They did it with Tommy and Des McAnuff was the director, and he’s the one that wants to do Yoshimi…It’s a strange opportunity but I know we’ve talked about it since 2003. Read more about “Yoshimi Battles The Pink Robots” backstory here. Additionally, the album Yoshimi Battles The Pink Robots recently turned ten and fans have been discussing the anniversary and waxing nostalgic here. Please come join us! What’s your favorite song on the album? When was the first time you heard it? Has “Do You Realize?? ?” made you cry??? ?